“Every piece is made by hand. One piece at a time. Every piece is finished by hand. One piece at a time. And every piece is supervised every step of the way by the artist who conceived it.” – Paul Evans describing is work for Directional Furniture. Paul Evans was a man of contradiction. At core, he was an artist noted for his fabulous work with metal. Never without his sketchbook close by, few could understand his doodles although he was constantly producing creative ideas. But Evans also was a driven entrepreneur–seeking somehow to reconcile the unreconcilable–making quick money with a labor-intensive artistic process. Evans is one to know because of his innovative furniture designs in metal and his metal sculpture. He trained at the famous Cranbrook Academy of Art (the Eames went there too, and it was run by Eero Saarinen’s dad Eliel Saarinen), he is considered a member of the American Craft Movement and he had a decades-long relationship with influential furniture manufacturer, Directional Furniture. At Directional, Evans set a ground- breaking standard for mass production, demanding that he retain complete artistic control over all of the pieces he made for them. Early in his career Evans was a silversmith at the working history museum at Sturbridge Village in Massachusetts, producing a beautiful, prizewinning silver in a traditional style. One fateful day in 1951, he stopped by the studio of Philips Lloyd Powell in New Hope, Pennsylvania, drawn-in by Powell’s bold modern furnishings in wood (Powell, also considered part of the American Craft Movement, is deserving of his own post). Evans asked Powell if he could display some of his work in Powell’s studio, and by 1955 Evans moved in. Coffee pots and jewelry made by Paul Evans in the early 1950’s. Paul Evans on the left with his sketchbook. Phillip Lloyd Powell on the right. Powell was very instrumental in Evans’ artistic path, being the first to encourage Evans to make larger pieces. The two fashioned decorative screens and other designs with a fish-scale pattern of welded iron. Together, Powell and Evans would go on to collaborate on furniture designs until 1964. Fish scale screen by Paul Evans and Phillip Lloyd Powell. Paul Evans and Phillip Lloyd Powell ccasional table, New Hope, PA, 1960s. Around 1958, Evans began to make copper chests with decorative doors and sculpted steel-front cabinets. 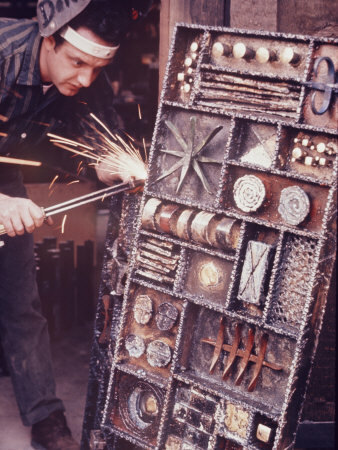 Evans’ manner of welding was unique in that he showed its tough nature, much like Powell would allow the figuring of the wood grain inform the shape and design of a piece. According to Todd Merrill and Julie V. Iovine in the book Modern Americana, Studio Furniture from High Craft to High Glam, journalists would refer to Evans work as “brutalist” but the artist himself never used that term. Each sculpted-front cabinet by Evans started as a wood “carcass” on a frame. Evans would sketch decorative elements, such as sunbursts, spiderwebs, pipes, buttons, and stalagmites, on the piece in chalk, typically in a grid format. These early pieces are among his most iconic. 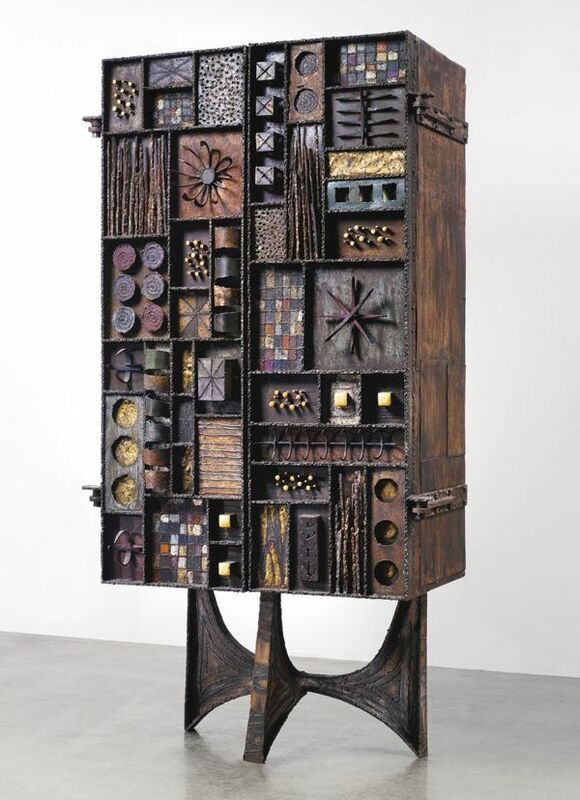 Sculpted-front cabinet by Paul Evans. Photo via Sotheby’s. By 1959, Evans hired Dorsey Reading, a machinist from nearby Lambertville, who became invaluable to Evans as his principal fabricator. Oddly, Evans was somewhat squeamish about certain materials and as time evolved he directed Reading’s every move, but Reading actually made the pieces. In 1961, Powell and Evans got a big break in the form of a two-man exhibition of their designs in New York held at what is today called the Museum of Art and Design. That exhibition caught the attention of Directional Furniture and led to the most important relationship in Evans’ career. Evan’s first collection for Directional Furniture debuted in 1964 and consisted of six steel coffee tables that he drove down to High Point to deliver. They all sold in less than a week. Powell also included wood pieces in this debut collection but he preferred a traditional artist’s life and ceased to collaborate with Evans and Directional afterward. Paul Evans worked with Directional Furniture until 1980 producing such collections as the Argente series, Sculpted Bronze Series, Sculptured and Painted Steel, Patchwork Copper, Pewter and Brass, and the Cityscape series. He was constantly experimenting with new technologies, materials and designs. For example, his Argente series involved sculpting in aluminum despite the fact that aluminum emitted highly toxic fumes (few of those pieces were made). This focus on new technologies and nonorganic materials further distinguished Evans from other members of the American Craft Movement who religiously adhered to handcrafted pieces made with time-honored tools and organic materials. An Argente cabinet by Paul Evans. Rare because the fabrication process emitted toxic fumes. 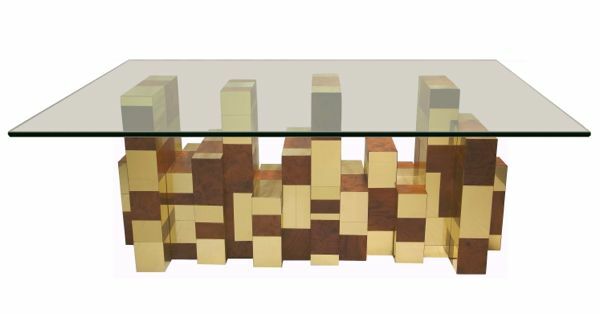 Paul Evans coffee table from the Cityscape collection for Directional. Paul Evans dining table, hand sculpted and patinated bronze and steel. In 1981, Evans opened his own showroom in New York City and a factory in Plumsteadville, PA. Reading, still his foreman, called this initiative the “kiss of death.” The showroom and factory left Evans in constant debt and unable to fulfill the orders he received. In 1987, at 56 years old, he decided to retire. He headed to his vacation home in Nantucket and the first morning there, he suffered a fatal heart attack while drinking a cup of coffee on the lawn, not even enjoying one full day of retirement. Today, Paul Evans’ work has an international following and can be found in the finest homes. If you are lucky enough to find a Paul Evans piece that you can afford to buy, keep in mind that most were signed. Paul Evans bed from the Cityscape collection. . Interior Design by Kelly Wearstler.